Rep. Luis Gutierrez (D-IL) whined about Breitbart News’ coverage of illegal immigrants and Muslim refugees during his recent commencement address at Cambridge College. “I ask you to never forget as they try to roll back voting rights and civil rights that people were murdered, churches were bombed, people were lynched, they were beaten and brutalized so we can have these voting rights and civil rights,” he said. He told the audience that he became active in politics after realizing that his fellow establishment Democrats were “bigoted.” Gutierrez told the graduates that in the 1980s, Democrats in Chicago asked him to vote for a Republican candidate for mayor because the Democrat, Harold Washington, was black. He said he was not “very political” at the time and just thought Washington, who would later endorse Gutierrez’s candidacy for Congress, was the best person for the job. Gutierrez said “these guys from the Democratic Party” were proving that “racism ran deep” and “something awoke in me.” He said he told his neighbors “what racist bigots they were” and urged them to not let “fear and bigotry” determine their votes. 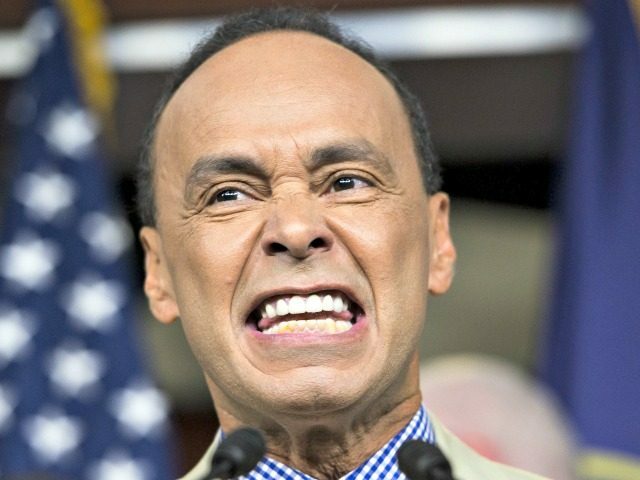 Gutierrez is well-known for his over-the-top rhetoric, histrionics, and outlandish predictions. When House Republicans passed the American Health Care Act last month, Gutierrez compared the passage of “Trumpcare” to Pearl Harbor, Fort Sumter, and the invasion of Iraq. Gutierrez also predicted on the House floor in 2014 that George W. Bush would be the last Republican president if Republicans did not work with his fellow Democrats to pass a massive comprehensive amnesty bill. Two years after the bipartisan effort to ram through amnesty failed—largely because of Breitbart News’ relentless reporting on the matter—Trump was elected president.